Labels can tell you a lot: what’s in your food, how much something costs, or how flammable it might be. The most important label on your windows is the NFRC label. NFRC stands for the National Fenestration Rating Council—“fenestration” is just a fancy Latin word for windows. Like their name implies, they are a national council that rates the performance of windows. All the major window manufacturers send their windows to the NFRC before they go to market. After they score a window, they slap a label on it with four numbers. These four numbers tell you everything you need to know about that window’s ability to save you money on energy bills. If you know how to read an NFRC label, you can stride into the showroom with the confidence that you’re getting the best window for you. U-Factor rates how well a window traps in heat. The lower the U-Factor, the better it traps in heat. U-Factor is the top-left score on the label, and the ratings run usually between 0.2 and 1.2. A low U-Factor is especially important in climates with very cold winters. SHGC rates how well a window blocks heat from getting inside. The lower the SGHC, the better the window blocks outside heat. SHGC is the top-right score on the label, and the ratings run between 0 and 1. Low SGHC ratings are especially important in climates with very hot summers. VT rates how much natural light can come through your window. The higher the VT, the more natural light is allowed to shine through. VT is the bottom-left score on the label, and the ratings run between 0 and 1. Your VT rating depends on how bright or dark you like the room to be. AL rates how much air leaks through the window. The lower the AL, the better the window keeps air out. AL is the bottom-right score on the label, and the ratings run usually between 0.1 and 0.3. It’s the only optional rating, meaning a manufacturer may opt out of putting it on their windows. A less common optional rating is Condensation Resistance, which is a score from 1-100 of how well the window resists the formation of condensation on its panes. The higher the rating, the less condensation is able to form. 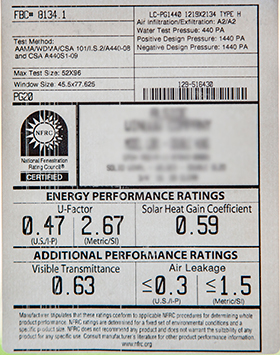 Most people know to look for the Energy Star Label on their windows, but don’t know that all Energy Star-rated windows must first be rated by the NFRC. All Energy Star products are eco-friendly, and when you know how to read an NFRC label, you know exactly how well your window will perform relative to others. The Window Source of Atlanta proudly carries windows with the NFRC label, so your window shopping is as simple as possible. Call us at (470) 275-5159 or get a free estimate online to find the best windows for you.